When I got into food and cooking I sort of lamented the fact that I don’t have a really strong culinary heritage. Both my mom’s dad and my dad’s dad were Air Force pilots and my dad followed suit, so we are all, by necessity, not particularly sentimental or attached to any geographic locations or their accompanying cuisines. I was lucky enough to spend most of my childhood in Maryland, but my mom doesn’t like seafood, so I didn’t really absorb the food culture of the east coast either. Watching travel shows like No Reservations made me ache for that deep-rooted identity that surrounds the way real born and bred locals live and eat – it just seems so romantic to me, but I’ve more recently realized that roots come with strings (metaphorically speaking). Italians, for example, hold their cuisine sacred. 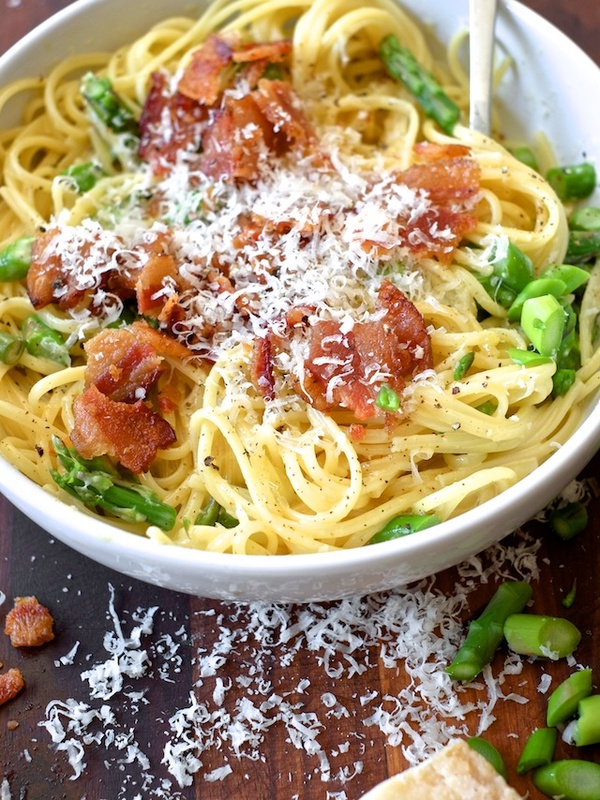 You slice your garlic, never grate it, pasta is a main, not a side, proper carbonara will not contain cream, etc. – the rules preserve the traditions, which I think is important, but it’s not for me. I dislike fettered-ness, which might have something to do with being a daughter of aviators (gravity, that’s cute). 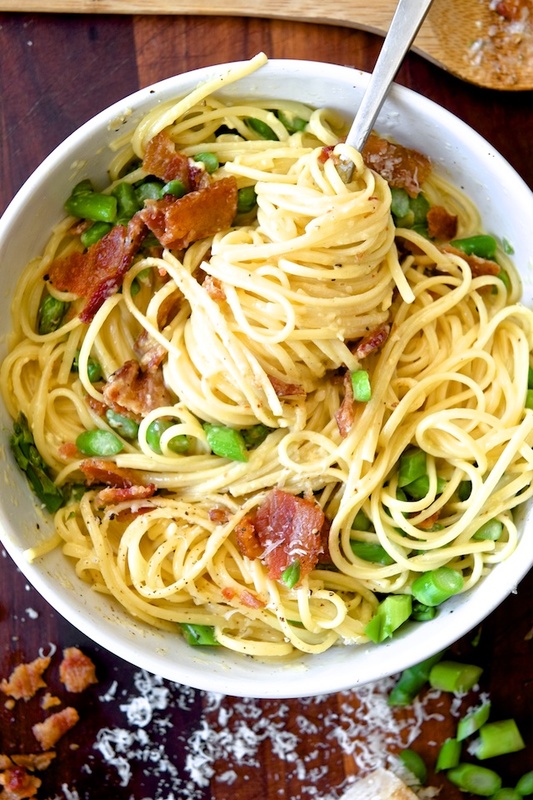 I like to think my lack of connection gives me an excuse for committing sins like this cream-drenched, American bacon-studded, asparagus-laden carbonara-esque, deliciously over-hyphenated pasta. I’ll leave it to others to preserve tradition. 1. Start by roasting your bacon in a 325 F oven until the fat is well rendered and the bacon is brown and crispy (about 30 minutes), then crumble it and set it aside. Cook your asparagus (I blanched mine but roasting on the same pan as the bacon would be smarter) and slice it to your desired length. 2. In a large serving bowl (big enough to hold your pasta) whip together egg, yolk, cream, parmesan, garlic, salt, and pepper. 3. Boil pasta according to package directions for al dente. Don’t forget to salt the pasta water. 4. Working quickly, drain your pasta, dump it into the bowl with the egg/cream/cheese mixture, and cover the bowl with plastic wrap or a plate. Allow the hot pasta to sit in the sauce mixture for 3-4 minutes to cook the egg slightly and thicken the sauce. 5. 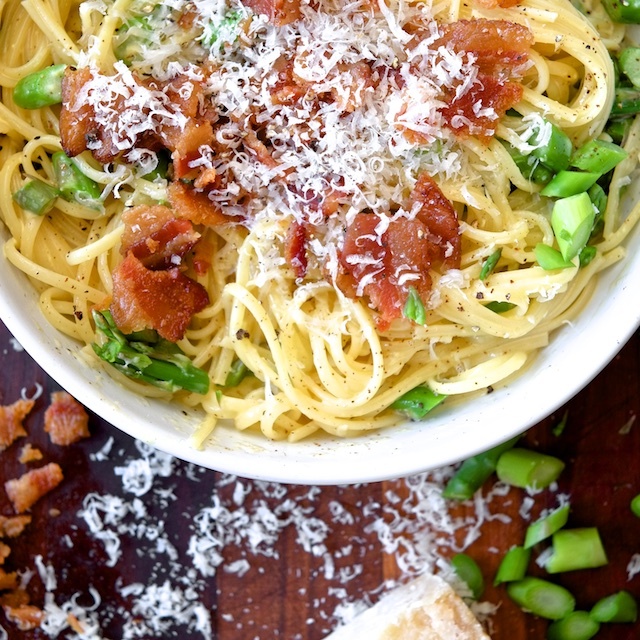 Toss the pasta with the sauce and add the asparagus and crumbled bacon. Taste for seasoning and finish with more salt (if needed), more pepper, or more parmesan (or all three). My dad was Air Force, too (and a pilot!) so I totally get you on the food culture thing -- I've always felt like my food upbringing was pretty generic. I sometimes wished that I had grown up with a more definitive food identity, but have made my peace with it. I guess, in a way, I did have it - it's a military culture. A little bit of everything. Oh, my! This looks so delicious! Gonna make this for myself!